Red foxes can run up to 30 miles an hour for short periods. Red foxes may leave bones and other objects around the den as toys for their young (kits). Red foxes belong to the Canidae family. Red foxes are small canids, approximately three feet in length including the tail, and weigh 7 to 14 pounds. They are the only mammals in Illinois with a coat of rusty red fur. The fur on the outer ears, legs, and feet are dark brown to blackish. The cheeks, throat, underside, and tip of the tail are white. There are three color phases in addition to the red phase. The melanistic phase is black; the silver phase is black with white tips; and the cross phase is red with black across the shoulders and back. In Illinois, these color phases are rare in the wild. Red foxes have five toes on the front feet and four toes on the rear feet. Gray foxes (Urocyon cinereoargenteus) are similar in size to red foxes but have a salt and pepper appearance to their fur and a black-tipped tail. 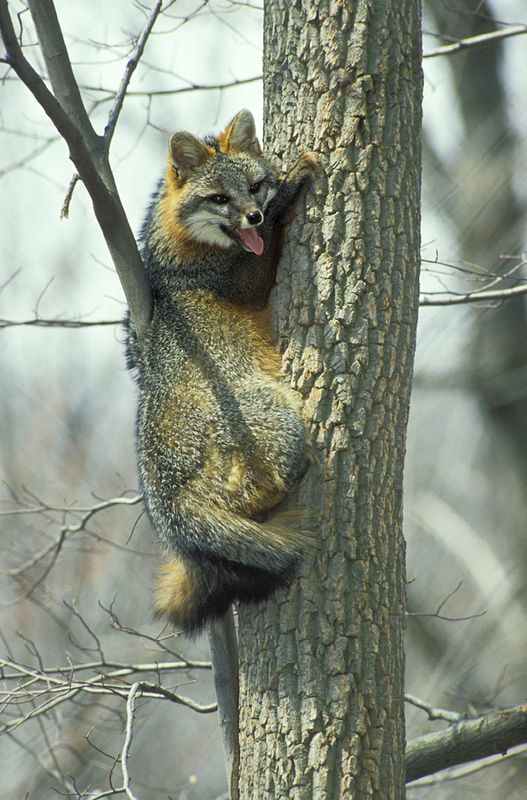 Gray foxes are found in more heavily forested areas than red foxes and are more likely to be seen in west-central and southern Illinois. The tracks of a fox are similar to those of a small coyote or dog. Like coyote tracks, fox tracks tend to run in a straight line. Fox droppings are similar to coyote droppings but smaller. The appearance depends upon the fox's diet and may include bone, fur, feathers, or seeds. Foxes are generalists and are able to use a variety of habitats. They can be found in forest edges, grasslands, agricultural areas, and in urban areas. They often sleep above ground but use a den for raising young and for shelter during inclement weather. Red foxes sometimes dig their own burrows but often expand abandoned woodchuck, badger, or fox dens. Red foxes may leave bones and other objects around the den as toys for their young (kits). 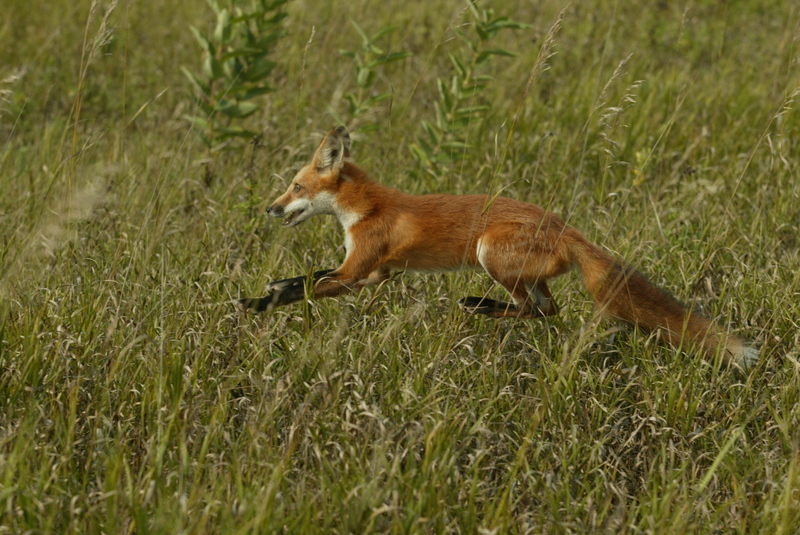 Red foxes can be found throughout Illinois but are less common in the southern part of the state. In good habitat, it is not uncommon to find three to four red foxes per square mile. Researchers in Illinois have found that as coyote populations continue to increase, red foxes are moving to urban areas to avoid competing against or being preyed upon by coyotes. Red foxes are monogamous and both sexes help care for the young, called kits. Breeding takes place in January through early February. Gestation is 49 to 56 days, and the kits are born in late March to April. Red foxes have one litter of four to ten kits each year. The kits have gray fur and their eyes open when they are about a week and a half old. Between their third and fifth week the kits begin coming to the den opening to receive meat from the adults. They are weaned by the time they are two months old and develop a sandy-colored coat during this time. By the end of June they will have developed their adult coat. 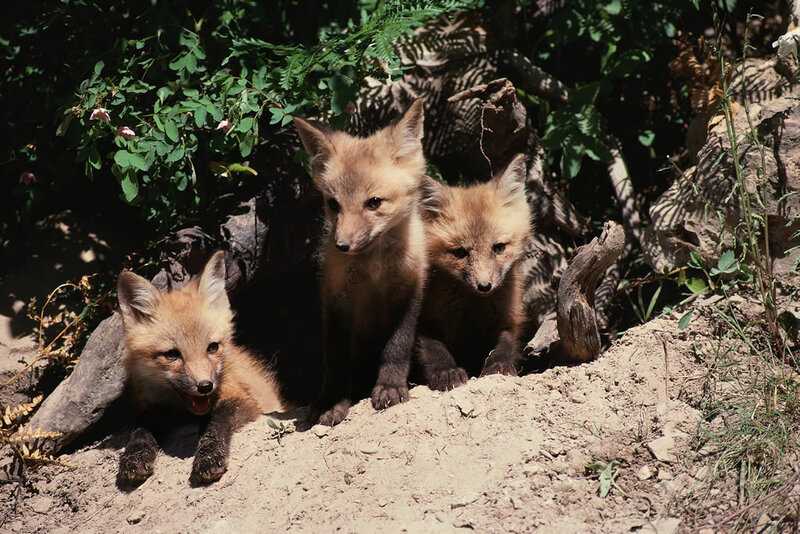 Kits go on hunting trips with the adults during the summer months and most disperse to new areas by the fall. Female offspring may stay on with the adults another year to provide for the next year's litter. Foxes are classified as carnivores, but they do eat some plant material. Depending on availability, they feed on rabbits, mice, and voles. They will also eat insects, bird eggs and nestlings, and fruit during the summer season. Occasionally an individual may take poultry. Red foxes will kill moles, shrews, or weasels though these species are usually not eaten. Red foxes often catch more food than they will eat at one time and cache (store) the food for later. Red foxes are nocturnal (active at night). They are often seen in the early morning or late evening while they are out hunting. During the summer months they live in family groups consisting of a male, female, the current year's young, and sometimes a female from the previous year's litter. In the fall and winter, they are typically solitary. Red foxes live three to seven years. Hawks, owls, and coyotes often take kits. Coyotes will kill adult foxes to reduce food competition in their territories. Outbreaks of sarcoptic mange occasionally cause major reductions in the fox population. This occurred most recently in the late 1960s and 1970s in Illinois. 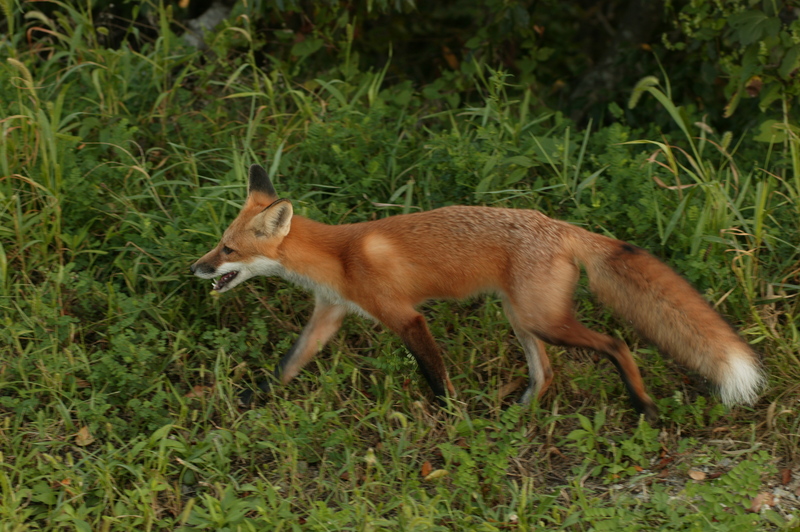 Vehicles are another major source of mortality for red foxes. Red foxes sometimes take poultry and can cause a nuisance when they burrow under buildings. Control rabbit and small mammal populations. To protect poultry make sure that fences are secure. Wire fencing should be buried at least 12 to 24 inches below ground to prevent foxes from digging underneath the fence. Wire mesh fences should have openings less than three inches to prevent foxes from squeezing through the fence. Since foxes are good climbers, it may be necessary to add a wire roof to keep determined foxes out. Providing a shed or other enclosure will help protect poultry. All doors or other openings should be shut at night. Predation of poultry occurs most frequently during late spring and summer when adults are provisioning their young. There are currently no approved repellents for foxes in Illinois. Frightening devices are typically ineffective at deterring foxes. If a fox is taking poultry or causing other problems they may be trapped and removed. If you want to hire someone to remove the fox for a fee, contact a Nuisance Wildlife Control Operator. 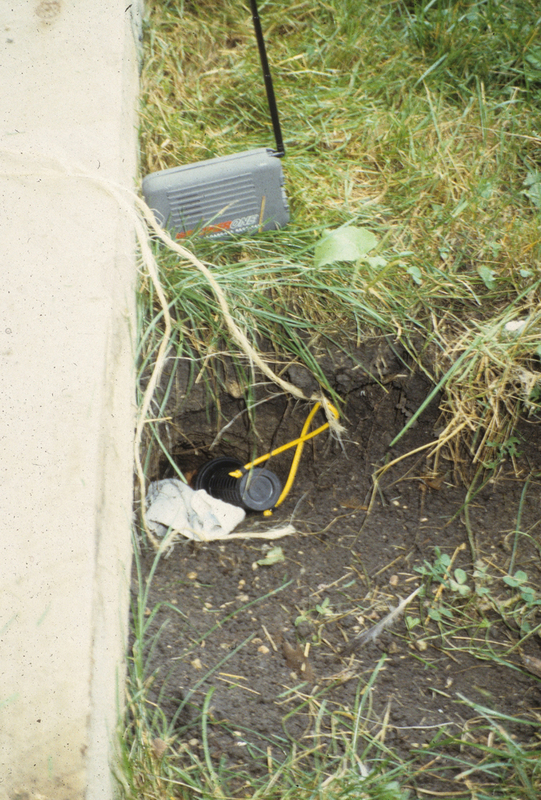 If you want to trap the animal yourself you will need an animal removal permit from an Illinois Department of Natural Resources District Wildlife Biologist. The biologist can provide information on capture and disposal techniques. Red foxes can be carriers of rabies, coccidiosis, and sarcoptic mange. Rabies can be transmitted to humans and is generally fatal if not treated quickly. Coccidiosis is an intestinal disease caused by various species of protozoan. Some species cause infections that result in mild symptoms such as diarrhea, but others are highly virulent and can be fatal. The disease is transmitted through contact with contaminated soil or water. Sarcoptic mange is highly infectious and is caused by burrowing mites. Sarcoptic mange can be transmitted to both people and pets in close contact with an infected fox. People are not a suitable host for the mite and the infection will clear on its own, though the infected skin may be itchy. Infected pets can be treated with medications prescribed by a veterinarian. 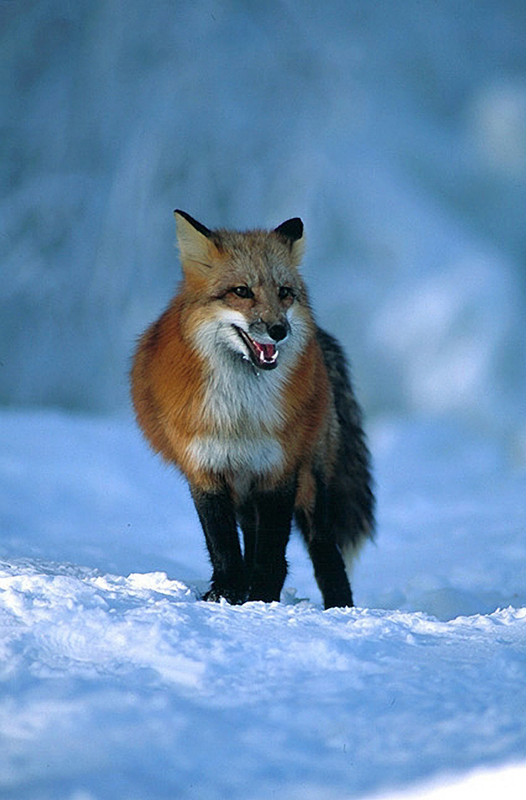 Red foxes help control small mammal and rabbit populations. In Illinois, red foxes are protected as Furbearers. If a fox in an urban area is causing a problem, it may be trapped and removed if an animal removal permit is issued by an IDNR District Wildlife Biologist. In rural areas, a trapping license is needed to harvest a red fox. Red foxes may be trapped from November through January. There is no limit to the number of red foxes an individual with a trapping license may take during season. For full regulations, visit the Hunting Regulations, Licenses, Permits and Applications website.